1. Dwarf hamsters can readily live in wire cages, but keep in mind that the wires must be extremely close together. If you’re looking into cheap hamster cages, look no further than the wire variety. They come in all shapes and sizes and can be found for as little as twelve dollars. 2. Aquariums come in a variety of sizes, allow for free roaming of your pet, and enable you to see what your hamster is doing at any time. A ten or twenty gallon aquarium with plenty of hamster cage accessories could just be your pet’s dream home. 3. Plastic cages are a little pricier than the wire versions, but it’s probably safe to say that, as far as dwarf hamster cages go, the favorite amongst hamsters themselves are of the plastic variety. That’s because they come in a variety of exciting shapes and feature really fun tunnels for your furry guy to run around in. 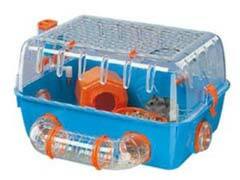 Remember that a major dwarf hamster care no-no is to purchase one of these homes with tubing that is too large. There you have it – a rundown of the different types of dwarf hamster cages. Take your space and budget into consideration before heading to the pet store, and rest assured that no matter what your needs, you’ll be able to find the perfect home for your pet amongst the choices in this review.